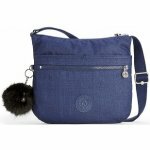 Kipling Arto K10878 women's cross body bag. It features a water repellent upper with a zipped main compartment. Inside the zipped pocket, phone pocket, pen loop and key clip provide extra storage space for your belongings. Meanwhile, on the outside it has 2 zipped front pockets and a zipped rear pocket so you can access your things quick and easy. A lightweight and spacious design. Available in night blue emb (navy), soft feather (navy multi), spark night (blue). 25 x 21 x 3 cm.